The sidebar is a very handy section of the WordPress website. It can be configured to be displayed either on the left or right side of your main content. It is usually set from the Widget menu option of the admin menu Appearance. You will have a long list of options that you can drag and set on to the sidebar. 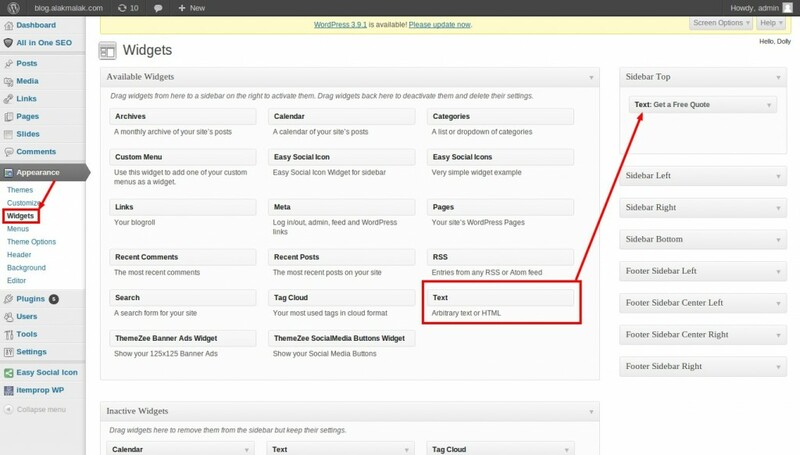 The default elements include recent posts, a search bar, categories list as well as other meta information. This can be quickly removed by dragging it off the sidebar in question. In addition to the left and right sidebar there is also the header and footer sidebar. In WordPress the sidebar has been designed such that it can be used by everyone. In the sense that you don’t need to be a well trained programmer to add elements to the sidebar. It is as simple as dragging and dropping. In addition to the default widgets you can also easily install additional widgets from the plugins section. Thus once your WordPress web developers have done the hard job of making the website you can actively change the website as you please. Alakmalak is one such company that offers WordPress Web Development services in India. To start with login to the admin section of your website and navigate to the widget section by going to the admin menu Appearance >> Widget. You then need to make sure that the widgets are related to the sidebar section. Now locate the template of the page from which you wish to remove the sidebar. This can be done by going to the pages section from the admin menu Pages >> All Pages and making a note of the template if any. (the template section for each page is in the right sidebar column). All you need to do is once you know which page to edit is to login to your server via FTP and navigate to your theme directory. Download the file in question and edit it in your favourite editor. Locate the code section <?php get_siderbar) ; ?> and simply comment it out if you don’t require the sidebar. Now save the file and upload it back to the server. Once you refresh your website in the browser you will notice that you no longer have a sidebar.